So would Cassie I bet!!!!!!! Xerxes would bay at it, the little jerk. Cassie was on her usual lizard hunt running around her yard area. It was warm today. I noticed Cassie was laying still under a chair on the patio. I went to check on her and she wasn't moving. I didn't touch her since I thought she wasn't feeling well. I noticed she puked up her dinner on the lawn. ...no lizard parts. I'll be feeding later and keeping her area more restricted in the summer heat. After a little while she slowly perked up. She's ok now. No food until tomorrow. Suddenly hot is hard on all us old ladies! Oh Poor Cassie. Good call until the food restriction has settled some. Does she like ice cubes? Oh [IMG class=inlineimg]/forums/images/smilies/frown.gif[/IMG] Poor Cassie. Good call until the food restriction has settled some. Does she like ice cubes? I do put some cubes in her water outside. Im going to start using a water sprayer to cool her off. Its going to cool down in the next few days. It was 75 degrees today and breeze. The temp is going down more than swing up some next week. Shes better, thanks for asking. Cassie is going to camp and boarding tomorrow to Monday since we're having guests for Easter. She'll have fun with her doggie friends and the staff. Last edited by Cassie; 04-19-2019 at 07:09 PM. Oooh a doggy vacation! Sounds like fun! Enjoy Easter! Yes it will be nice with family. 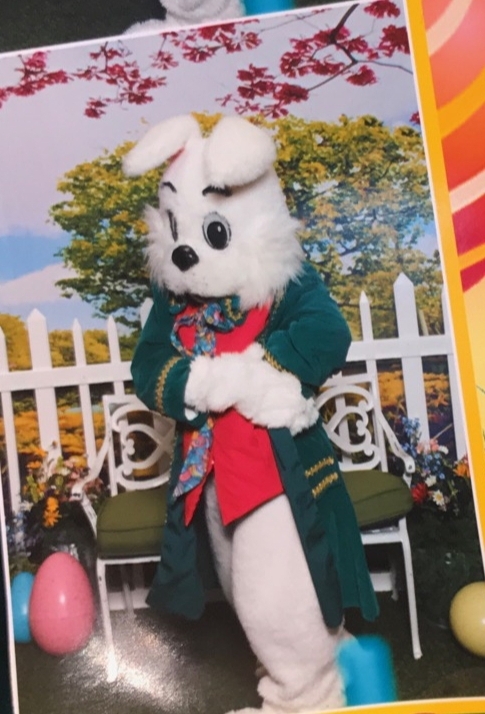 Here's a picture of my almost 16yr granddaughter working as the Easter bunny at the mall...! Aww! That's amazing! I hope she enjoys it. Sounds like a fun job.